Product categories of Shell Forming Machine, we are specialized manufacturers from China, Shell Forming Machine, Air Conditioner Case forming machine suppliers/factory, wholesale high-quality products of Air conditioner case Folding machine R & D and manufacturing, we have the perfect after-sales service and technical support. Look forward to your cooperation! 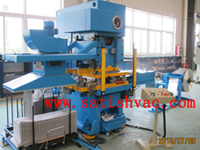 This is machine is professional designed and fabricated for Air conditioner Case Forming, folding purpose. PLC Smart controlling, Pneumatic or Air cylinder driven forming. Big brand components for high quality building.